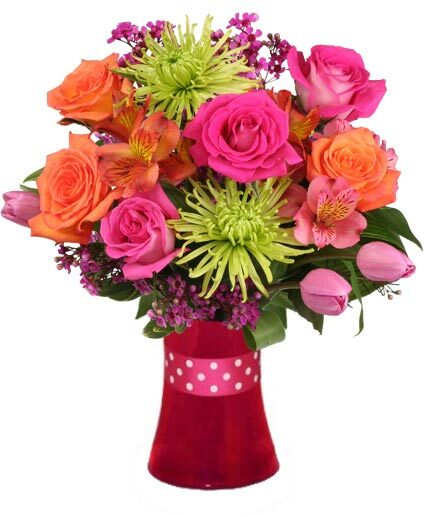 Vibrant Vibes Arrangement in Fort Wayne, IN - MORING'S FLOWERS & GIFTS, INC.
MORING'S FLOWERS & GIFTS, INC.
Fort Wayne FLORIST - MORING'S FLOWERS & GIFTS, INC.
Spring into summer with this colorful, eye-popping bouquet from MORING'S FLOWERS & GIFTS, INC.! Blooming with hot pink and orange roses, lime green Fuji mums, pink tulips and stems of orange and pink alstroemeria, our Vibrant Vibes will brighten up the room and boost their spirits to the sky! Call and place a direct order or send fun and cheerful flowers now from our website. 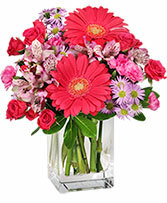 Call MORING'S FLOWERS & GIFTS, INC. and send flowers with feelings that come straight from the heart. Make someone's day more memorable with this charming basket of pink lilies, roses, alstroemeria, carnations and freesia.